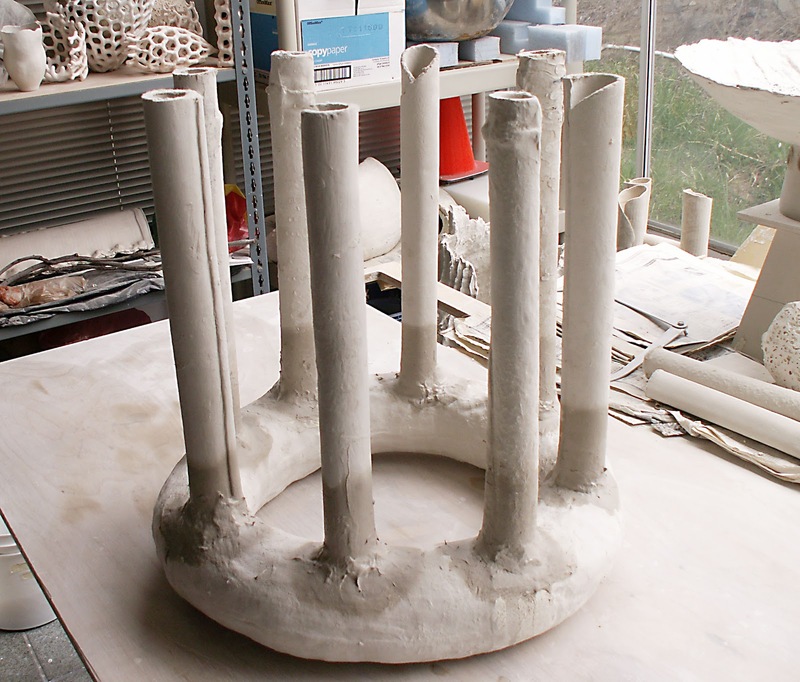 Whenever I build my pod shaped vessels, I have to think about how to fire them in the kiln for bisque fire and at higher cones, for example at cone 5 or cone 10. In this piece, I wanted to use the Van Gilden’s flashing slip which cracks really nicely at Cone 10 so I had to design a structural support system that will be strong enough to survive a Cone 10 fire. The donut ring and supporting tubes were all assembled from bone dry paper clay pieces using dry to dry techniques (top picture). 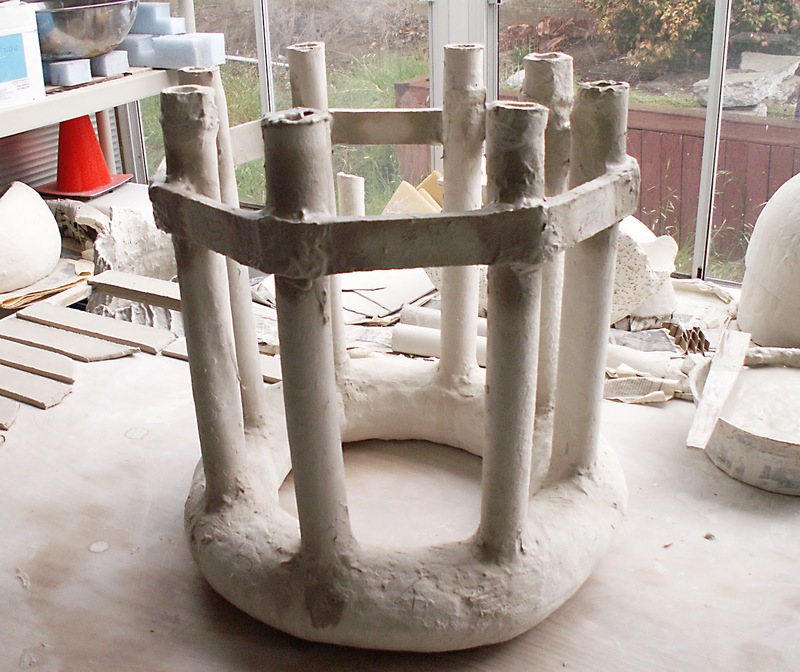 As my pod is rather heavy and tall (36” high), my support has to be well constructed to withstand any movement in the kiln during firing. The legs were thick slabs rolled into tubes. Lateral struts at the bottom were added to give sideways rigidity. This is structural support for my pod which can be seen in the background. The Van Gilden's flashing slip has been applied to it. 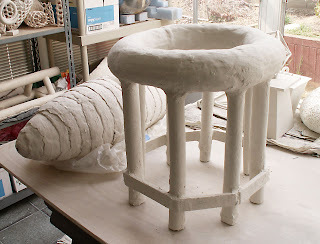 It's bone dry and it's ready for bisque firing. In a way, the structural support is like a piece of sculpture in itself. I plan to reuse this support for future works. 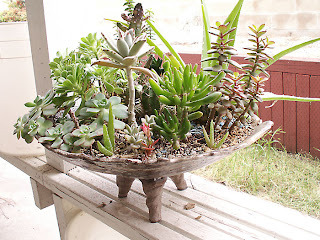 Like all growing things, my succulents have started to outgrow the planter I made for them some years ago. In my old planter which I made out of scraps of salvaged regular clay from the fine arts center, I had to make drainage holes at the bottom of the bowl. This time I decided to try something new. 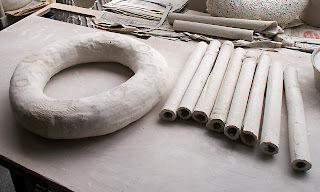 Instead of having to drill drainage holes in the leather hard clay, I incorporated coarse coffee grinds in my paper clay to make the bottom. I then build up the sides with paper clay to complete the planter. 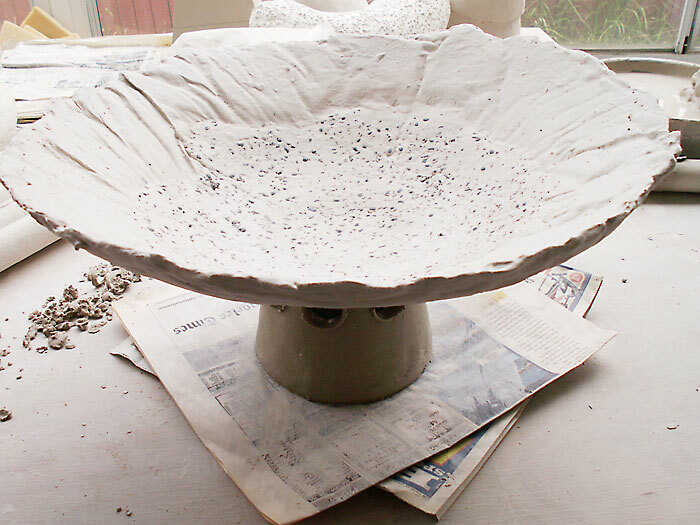 In the bisque fire, the coffee grinds will burn out creating naturally occuring drainage holes, kind of like a colander. I made a base for the planter to raise it above the ground. This was a quick and rough piece since I wanted to use it in my patio. It is also an experimental piece. 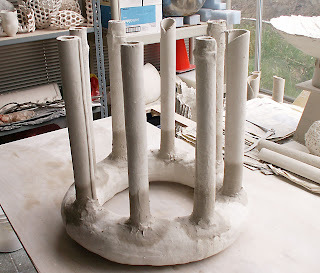 I plan to glaze the sides and base but not the bottom as the glaze will clog up the “coffee-holes.” I’ll post again once I have this piece finished.